For sacrament meeting, our primary will be singing Teach Me to Walk in the Light found HERE. The congregation will be joining us on the 2nd and 3rd verses. Since I didn't teach the 2nd and 3rd verses, I will simply be posting words so the primary can sing along if they are able to read. I will be conducting the primary and the music leader will stand and bring in the congregation when it's time. Then for singing time, since we sung most of the songs in the Children's Songbook about mothers on Mother's Day, I thought it would only be appropriate to do the same for Father's Day. I noticed that there aren't NEARLY as many songs about fathers as there are about mothers...interesting. Below is what I plan on doing this Sunday. However, you can check out all my past Father's Day singing time lesson plans HERE (scroll through them all) in case you want something different. I'll be dressing up the 3 members of our bishopric (but any father from the ward will do) similar to pictured above. I don't have a pattern as I just cut circles and facial features out of construction paper and glued them on to brown paper bags. There are holes cut out in the eyes. Then each will wear a big sheet that I'll tie behind their neck in the back (exposing their arms). Each bag has a tie glued on with a song title. Find my documents HERE. I printed on various colors of card stock for durability. There is also a blank tie in case you have different songs, as any songs will do (fathers' favorites or review this year's program songs, etc). Each disguised bishopric member will lead the kids in the song until he feels they have all sung their very best. I'll aid in the leading by posting the words (see how I do that HERE) and singing along with the CD to begin with, gradually moving over to the piano (the kids all KNOW Daddy's Homecoming so that will definitely be an easy one). 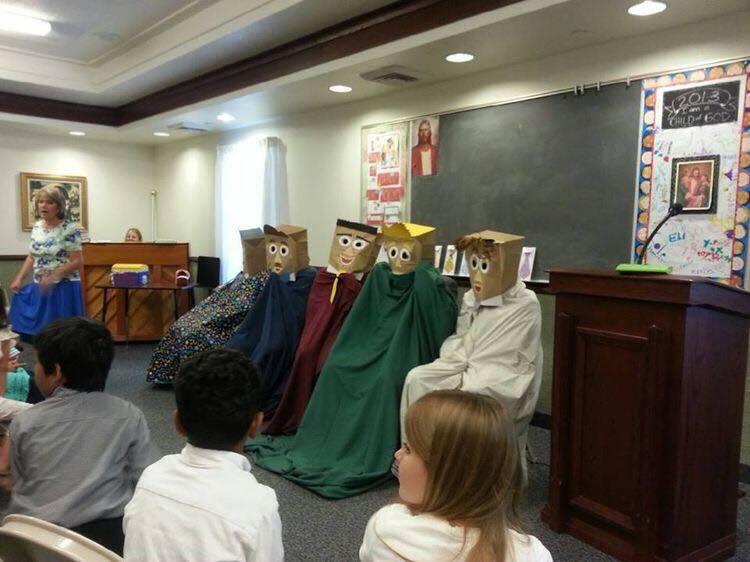 When the kids have sung the song well, the disguised bishopric member will reveal himself. Then we'll move on to the next bishopric member, ending with the bishop who will lead the song, Fathers (since it talks about the "father of our ward"). There are lots of variations to this - most of those are all listed on the FB Choristers link that's posted above if you want more ideas. Thank you Camille. This is such a great idea. I am excited to do sharing time this Sunday for Father's day. Masks should not be worn, not even for Halloween. You're taking the article out of context. The purpose is to be yourself and not hide that behind hate or other things, not literally never wearing physical masks. I think this is perfectly fine (and brilliantly creative!) for teaching kids songs about Jesus Christ. Thank you for sharing, Camille!